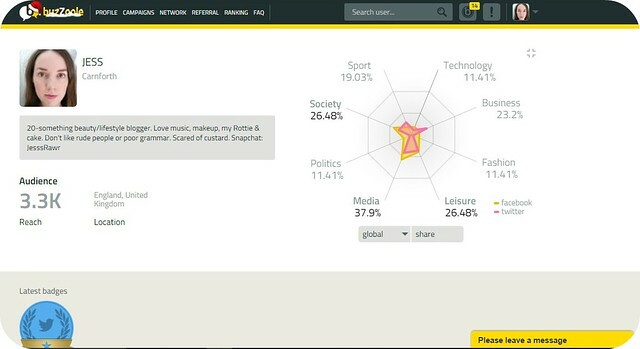 I've recently been introduced to a new influencer marketing platform; Buzzoole helps users to identify their most influential topics across a range of social media platforms, and then automatically selects the best-fit users for brand campaigns. Participating in a campaign earns you Buzzoole credits which are redeemable for Amazon vouchers; 50 credits can be converted to €15 of Amazon vouchers, whilst 150 credits will get you €50, and 250 credits converts to a whopping €100 to spend on Amazon! 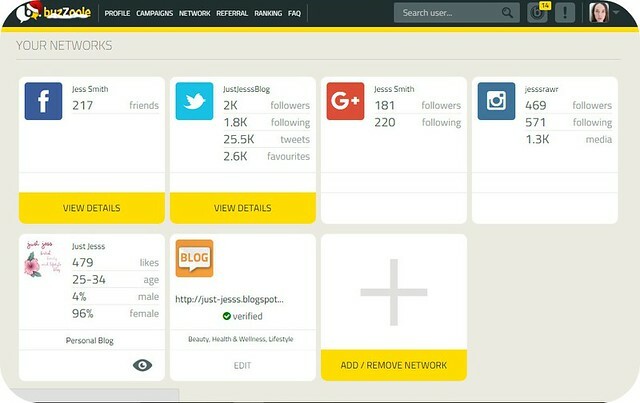 I found it really easy to add my social networks to my Buzzoole profile; I signed up using my blog Twitter account, and you can then authorise additional accounts such as your personal Facebook profile and any Facebook pages you manage, Instagram, Google+, LinkedIn, Youtube, and a blog. These are then analysed to identify the highest areas of influence; you can see above that apparently I am most influential on Leisure, Media and Society, which I suppose makes sense. Currently it's only my Facebook and Twitter profiles which are contributing to these scores. You can also see the 'latest badges' panel; I only have one badge for apparently being 'Twitter Addicted', but these are awarded based on your social media audience, performance on campaigns, and your referrals to the Buzzoole program. Here you can see the networks I've added to my profile; it's an easy way to keep track of your following and sharing on each platform, as well as showing you some metrics about your Facebook page. Adding more networks really is as simple as clicking the 'Add/Remove Network' button, selecting the network you wish to add, and authorising it. So far I've only been accepted to one campaign, but I've found that it's easy to see what's expected of you, what the timescale is, and what you'll receive in return in terms of Buzzoole credits. Some campaigns offer products for review as well. You can also earn credits in a few other ways; completing your Buzzoole profile, downloading the app onto your iPhone or Android phone, and referring new members. If you sign up via my referral link here, I'll get 1 Buzzoole credit, and then when you complete your first campaign we get 50 credits each! You can earn up to 1000 credits (€400) in this way. If Buzzoole sounds like something you'd be interested in, you can sign up here and have a look round; I've found it really easy to get to grips with, and I'm hoping it'll be a nice way to supplement my income here and there. I'm not expecting huge sums of money and, of course, Amazon vouchers don't pay the bills, but they come in handy for everything from stocking up my bookshelf to buying Christmas and birthday presents through the year. Update 5th February: I just want to confirm that I've received my first Amazon voucher with no issues; Buzzoole do say it can take up to 30 days to process, but I redeemed £100 on the 18th January and have received the voucher code via email today, so it only took a little longer than a fortnight. Have you heard of Buzzoole before? Is it something you'd be interested in signing up to? I'd love to hear what you think!! Is it just for UK? Cause this sounds like really great and useful site! Wow, I'm definitely signing up for this! How long did it take for you to earn your first £100?